Events are time-limited contests to win various rewards dependent on the type of event. In general, the starting hour of the regular short events is 15:00 UTC and the ending hour is 07:00 UTC. The general starting hour for major events is 12:00 UTC whereas the ending hour varies. Most events that occur in the game pit Trainers against each other in various settings under different conditions. Some events require that Gold is collected or spent, some require that Food is collected or be given to Dragons, others require Gems to be spent, others require Trainers to work as a team (either as part of a Clan or on their own). In these events, there are two areas for obtaining rewards; final placement on the leaderboard and completion of milestones. Some events do not pit Trainers against each other, but rather have them complete various tasks individually. Trainers can take part in events after reaching Level 7, but Clan Events require Level 25 (the level required in order for Trainers to join a Clan). Most events are worldwide, which means any DML Trainer can join. Some events, however, are country or platform-specific and only those who qualify may participate. In addition, there are various events in which only Trainers with an active VIP Status are able to participate. When this is the case, the option will be shown under the milestone rewards, selecting it will take the Trainer to the interface for purchasing VIP Status. All events, except Clan Events, can be accessed through the boat at the pier or through a bar under the Trainer level. This bar will cycle through all the available events that can be accessed from there. With the exception of Clan Events, whenever a new event(s) starts, the list of events will pop up, where events that are new and the Trainer has not yet taken part in will have the icon across their top-right corner. Selecting any available event's window will display the conditions needed to compete in it, the prizes that can be won (from the milestone or leaderboard) and the option to take part in that event through the button. Once that button is pressed, there is no option to cancel the participation and the position and score of the Trainer become available to see in the section above the milestone rewards. Additionally, there are some events in which Trainers take part in automatically. Most events are based on the Trainer's Level, giving different leaderboard brackets for groups by level. Therefore, the higher the level, the tougher the competition may be. Additionally, if the number of Trainers in the same level brackets exceeds the number of positions on a leaderboard, multiple groups of Trainers will exist, meaning the event will not be limited to the number of said positions. The level brackets also affect the milestones of events. The button can be found next to the position and score. It can be pressed to see the position and scores of the opposing Trainers. Additionally, when Dragons are offered as the first prize, the will be made available next to their name and pressing it will display the Dragon's base Codex Entry. The maximum score the Trainer can have in an event is limited by the in-game technical capacity of 2,147,483,647, except for Gold Spending and Gold Collecting Events which have no limit. Thus, in theory, if there are events where the number of Trainers with the maximum score exceeds the number of allotted spots for the main prize, all Trainers with that score will receive the prize. However, the maximum score displayed is not, from a technical standpoint, at maximum, as it is unlikely to have even scores at this stage. This is further sustained by the fact that amounts over two billion are only represented by the first five digits. Wherever Food and Gold are offered as prizes, the amount earned changes by a certain Level Modifier that increases the higher the Trainer's level. The modifier can change whenever a Trainer's level increases, affecting the amount of Food and Gold earned from an event the Trainer might be taking part in. While not events in the true sense of the word, Dragon of the Month and Dragon of the Week are so-called breeding events whose sole purpose is to successfully breed a Limited-Time Dragon in the allotted time with the Dragon being the event reward. 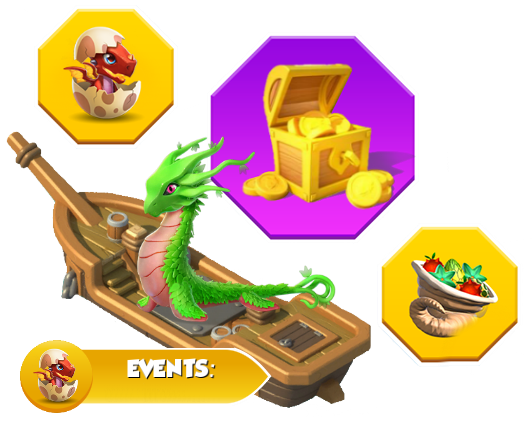 Whenever Dragons are featured as prizes for any type of event, one will appear on the boat at the pier at the bottom of the Main Island. Dragons featured in time-limited breeding events will also appear inside a button in the bottom right-hand corner of the screen. Lastly, there is another type of event called Frenzy Days. This type of event is not a competition and there is no prize awarded at the end of the event. These events run for a period of 24 hours and during the running of such an event, a certain currency or resource is made obtainable in larger amounts than normal. The events are listed in chronological order. Sorting is not possible in mobile view. Hovering over N with the mouse cursor will reveal the exact part of the event in which the related Dragon was obtainable. The lack of N in cells with just one Dragon means said Dragon was the main prize of that event. Update 4.1 modified the cooldown timers for Boss Challenges from the same fixed timer for all battles to one that gradually increases with each battle. The groups of levels for the event brackets have been modified starting with the 23rd of November. Update 4.0 introduced Chain Breeding Events. The screen interface for events was modified so that they are no longer represented through a horizontal, rectangular banner, but through a vertical, rectangular window. Additionally, the background has been changed and the prize Dragon is no longer represented through a mugshot, but through a full-body image. Update 3.9 introduced Collection Events. Update 3.7 introduced Mystic Pasture. Update 3.3 introduced Frenzy Days. 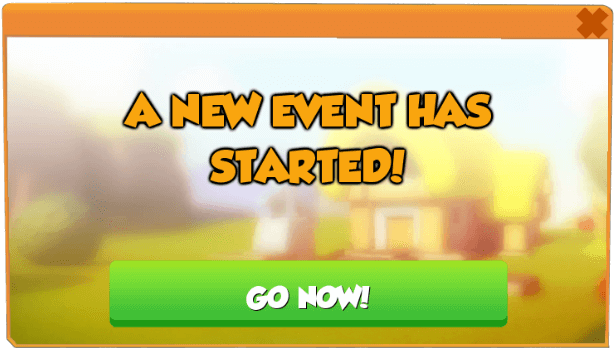 Starting with this update, events that do not occur regularly will now generally begin at 12:00 UTC. Castle Events are now available starting with Level 7 instead of Level 12. Update 3.1 introduced Relay Events. Update 3.0 introduced a new type of Clan Event called Clan Siege. The refreshing timer in Arcade Events was increased from 10 minutes to 60 minutes while Dragon Pieces are no longer offered as rewards in this type of event. Update 2.9 introduced Arcade Events. The graphics for Solo Events were slightly altered, making notifications for when new items are received more visible while the cooldown period until items can be obtained again is now shown under each item. Additionally, these no longer feature an accompanying flavored description. Starting with this update, Gold earned from selling no longer counts for Gold Collecting Events. Update 2.8 altered the event bar in order to cycle between the available events rather than to show a fixed text. The pop-up notification for new events was replaced by the list of events popping up and displaying the new events. Currency generators were introduced for Castle Events. Update 2.6 discontinued Feel the Fury, Settle the Score and Winner Takes All Clan Events, and replaced them with The Great Dragon Race events. The name of the Dragon offered as a prize will now be displayed next to the icon on leaderboards. Update 2.5 discontinued Feeding Events with specific Elements, allowing all kinds of Dragons to be fed now. Update 2.4 introduced Calendar Events. Update 2.3 introduced Gold Spending Events. Starting with this update, the icon is no longer displayed when Dragons are offered as milestone rewards, instead, an image of their baby form is shown. An extra level was added to regular Castle Events, bringing the total number to 6 levels. Additionally, hatching Dragons is no longer a method for earning currency for these events and has been replaced by catching creatures. Update 2.2 introduced Community Events. Slight graphical alterations were brought to all events (excluding Clan Events), especially to leaderboards (where each group of positions is now separated by a gray line). Update 2.1 introduced Castle Events. Update 2.0 introduced Clan Events. Update 1.9 discontinued spending Gold as a task in Solo Events. Update 1.8 added a new tier for event brackets, limiting the fifth tier to Trainers between the levels 56-70 and grouping Trainers above Level 70 in the sixth tier. Before this update, there were only five tiers of event brackets and Trainers above Level 55 were in the last tier. Catching creatures was introduced as a task for Solo Events. The leaderboard positions and rewards, as well as the milestone scores and rewards, were changed, with some being lowered and some being increased. Slight alterations were also done to these as well as the overall event interface. Update 1.6 introduced Faction Events and brought slight graphical alterations to events, such as the description for events now being written over a white background instead of a gray one and a pop-up notification being displayed whenever new events occur in the game. Starting with two days before the release of this update, Gold Collecting Events requiring Gold to be collected from Habitats were discontinued, thus Gold can be collected from any source now. Update 1.5 changed the refilling time for pool items in Solo Events so that it starts refilling as soon as an item is obtained rather than when the pool is fully empty. Food Gathering Events no longer limit collecting Food from Farms, instead, Food can now be collected from any source. Update 1.4 introduced Gem Spending Events. The number of tiers for Solo Events was lowered from 15 to 10. Additionally, the button is no longer used to purchase all the items of the current tier, instead, each tier now has a button inside their snapshot used for this purpose. Update 1.3 increased the tiers for Solo Events from 5 to 10 and added new tasks, namely breeding hybrid Dragons, winning Clockwork Dungeon fights, spending Gold and gifting friends. The task of winning battles in the Dragon League has been replaced by the task of winning any kind of battle. Update 1.2 added a ship off of the Main Island that can be pressed to bring up the available events, in addition to the event bar. Exploring ruins has been discontinued as a task for Solo Events. The amount of Food and Gold from leaderboards now scale in accordance to the newly-introduced Level Modifier. Update 1.1 introduced Solo Events. This category has the following 19 subcategories, out of 19 total. The following 200 pages are in this category, out of 792 total. This page was last edited on 19 April 2019, at 20:56.